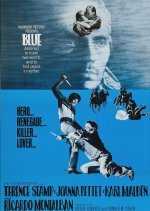 Western starring Terence Stamp. A young American, raised by a Mexican bandit, is forced to choose his way of life when he falls in love with the daughter of white settlers. Strikingly photographed by Stanley Cortez - who also shot The Magnificent Ambersons and The Night of the Hunter - this is an otherwise undistinguished western from Canadian director Silvio Narizzano. As the adopted son of Mexican bandit Ricardo Montalban, Terence Stamp rescues respectable Karl Malden and his daughter Joanna Pettet only to learn the hard facts of life in the Old West. Attempting to reproduce the sort of steely-eyed smouldering you'd expect of Franco Nero, Stamp opts for striking a series of poses rather than giving a rounded performance.